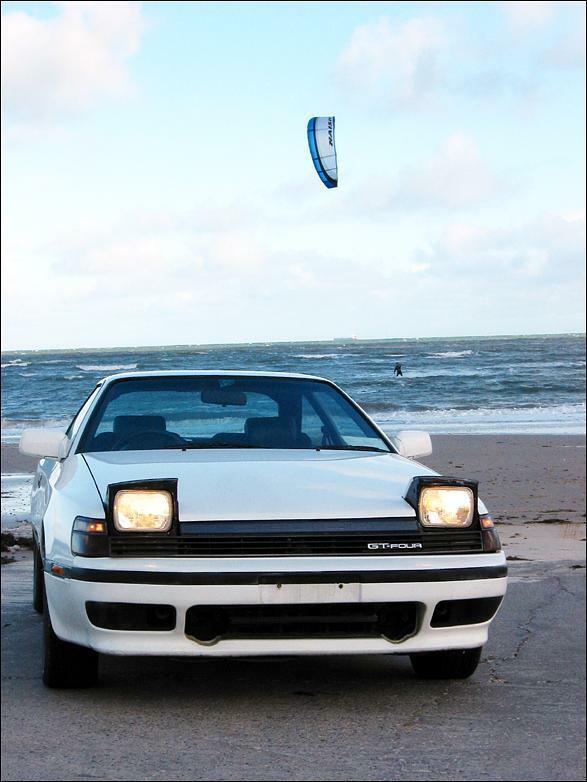 It was Toyota more than any other manufacturer that made the most of the new Group A rally format; with the introduction of the new regulations, Toyota set about building a turbocharged, all-wheel-drive version of its newly released ST165 front-drive Celica. Released to the public in October 1987 and making its competition debut in 1988, the ST165 GT4 (aka All-Trac in America) was Toyota's first serious attempt at top-level rallying; the mighty GT4 went on to make history by taking Carlos Sainz to a 1990 World Rally Champion title. Of course, while Carlos Sainz and various other competition drivers were testing the GT4's mettle on rally special stages, it was Joe Average - in Japan, UK and America - that could walk into their local Toyota dealership and make an order for their own road-going GT4. The 'win on Sunday sell on Monday' philosophy really came into effect - even if the car was quite expensive compared to other coupes. The ST165 GT4 was a very significant vehicle, though - it introduced buyers to the level of performance, sophistication and security that we now automatically associate with all-wheel-drive turbocars. 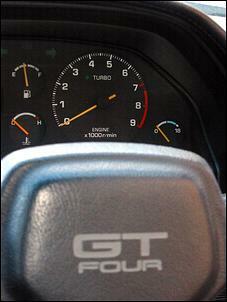 Under the bonnet, the GT4 boasts a turbocharged and intercooled version of the atmo 3S-GE engine - the 3S-GTE. With an 86mm bore and stroke, the GT4's in-line transverse four sweeps a total of 1998cc and features fully floating pistons delivering a static compression ratio of 8.5:1. 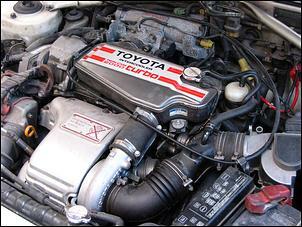 An oil cooler is also fitted to ensure engine longevity. The Yamaha developed aluminium 16-valve cylinder head incorporates pent-roof combustion chambers and two belt driven camshafts. 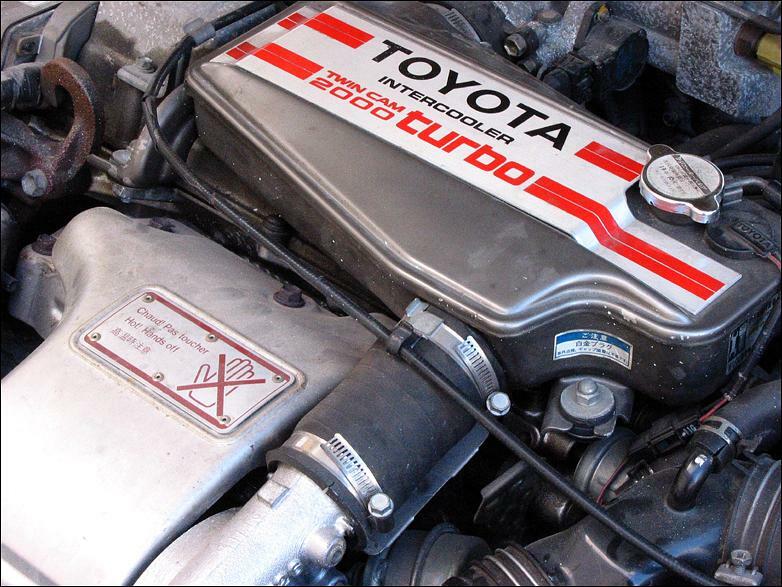 Blowing induction air into the engine is a Toyota CT26 water-cooled turbocharger teamed with a water-to-air intercooler and a relatively sophisticated engine management system, which is based on the Bosch L-Jetronic system. With boost pressure factory set to around 9 - 10 psi, the Japanese-spec ST165 GT4 is rated at 136kW at 6000 and 240Nm at 3200 rpm. On the road, our test vehicle (provided by Adelaide Japanese Imports) showed quite good throttle response - for a turbocar - with good torque from low rpm; the boost light on the dash can be seen illuminating from as low as 1500 rpm. Mid-range is certainly where the car feels strongest, though, as accelerative urge falls over noticeably above about 5500 - 6000 rpm. Work the 5-speed gearbox so you're hovering between peak torque and peak rpm and the ST165 GT4 can haul you from point to point quite swiftly. Aside from its engine, though, the other attraction of the GT4 is its AWD system. Unlike most other manufacturers of the time, Toyota gave its GT4 a proper full-time all-wheel-drive system - not a basic 'on-demand' lock-up 4WD system. 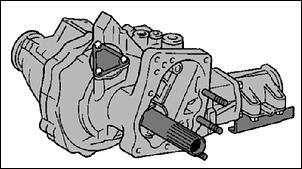 The transverse gearbox was equipped with a viscous coupling, which apportions torque to the front and rear wheels depending on front-to-rear tyre slip; the axle with the most traction is the one that receives the most torque. In static conditions, however, the torque split is 50:50 front-to-rear. The newly installed rear differential, meanwhile, is of the Torsen limited-slip variety while the front differential uses an open-centre. Total traction enables the ST165 GT4 - which is not particularly light at 1360 kilograms - to accelerate from standstill to 100 km/h in high 7s/low 8s; quick, but it's no rocketship in standard form. Excellent aerodynamics allows a top speed of around 215 km/h. 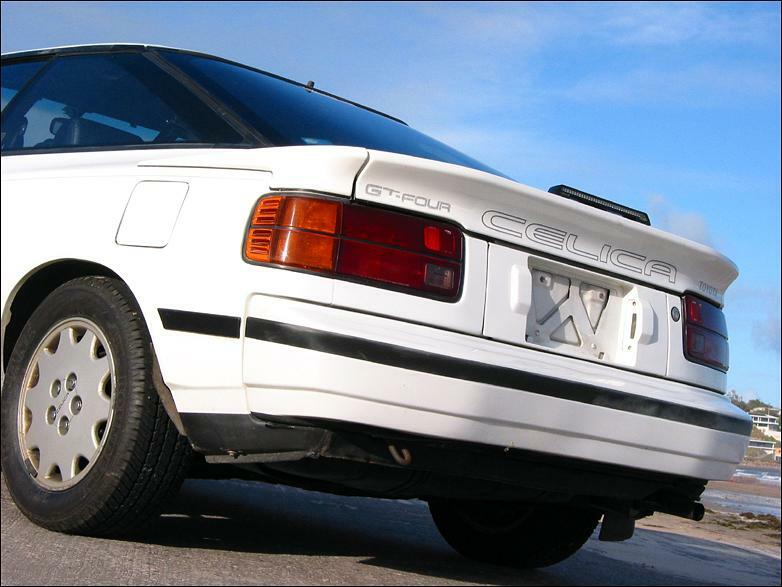 Not surprisingly, Toyota chose not to make any drastic suspension changes for the AWD GT4; the ST165 chassis design was already quite brilliant in its time. The front suspension comprises MacPherson struts with an anti-swaybar and strut tower brace, while the rear employs struts with a trailing link and twin lateral links per side plus an anti-swaybar. 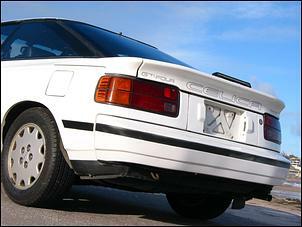 A new rear sub-frame was also introduced to accommodate the rear drive system. Our test vehicle showed excellent straight-line stability at all speeds and remained composed through each and every corner. The tyres fitted to 'our' vehicle, though, were worse than the standard items (which happen to be 195/50 14 inch Pirelli P600s), so grip levels were quite low; this exaggerated the car's natural tendency to understeer. On the upside, the ride is surprisingly soft for a rally-bred sportscar. The steering arrangement is a power assisted rack-and-pinion one with 2.9 turns lock-to-lock and nice, linear response. Braking, meanwhile, is via 254mm ventilated front discs with twin-pot calipers and 265mm solid rears with single pot calipers. Stopping power was up to standard during our test. 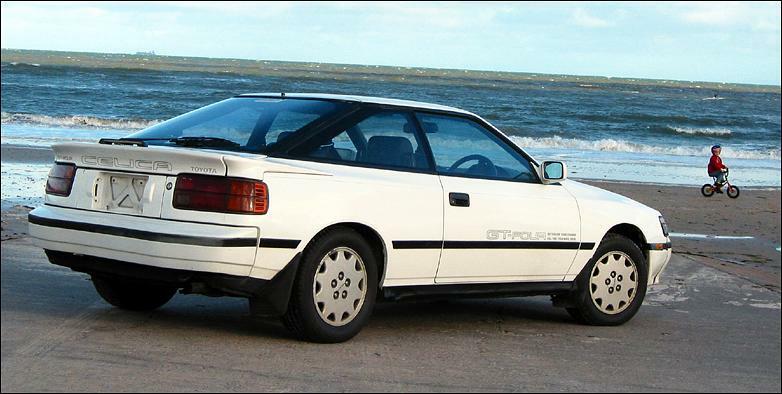 Very few cars born in 1987 have aged as gracefully as the ST165 Celica hatch (note that there was never a notchback version of the GT4). It's graceful curves - incorporating pop-up headlights - large glass areas and balanced proportions remain aesthetically pleasing even 15 years on. The cosmetic differences of the GT4 are subtle; in addition to the Celica SX-spec rear spoiler there's a revised front bumper with twin fog lights (which were missing on our test car), larger side mouldings and a few stickers. There are no bonnet scoops or vents to be found. From all accounts, the 14-inch alloys are also the same as those fitted to the atmo front-wheel-drive ST165 models. Inside, the Celica is - again - much more modern than most other cars from its era; its dash layout and interior packaging were absolutely right up to the minute. 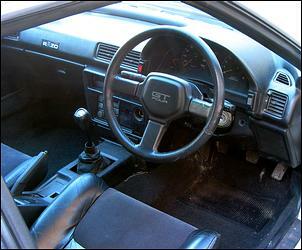 The GT4 came comprehensively equipped with fabric/leather seats (featuring electric lumbar and side bolster adjustment), leather steering wheel and gear knob, tilt and reach adjustable steering wheel, central locking, analogue climate control, electric windows and mirrors (retractable on the Japanese version) and a double-DIN radio/cassette with four speakers. Instrumentation comprises a Japanese 180 km/h speedo, 6800 redline tacho, boost light, fuel level, coolant temp, oil temp and battery voltage gauges all laid out in a very clear manner. Overall, the interior is very comfortable and functional, but there are a few constant reminders of its age - like the long throw gearshift, large diameter steering wheel and the considerable engine noise. Not surprisingly, rear accommodation is quite limited but it's no worse than, say, a Nissan S13 180SX. A reasonable amount of luggage can be thrown in the cargo area - under which you'll find the space saver spare wheel - and the split rear backrests can be folded forward if need be. 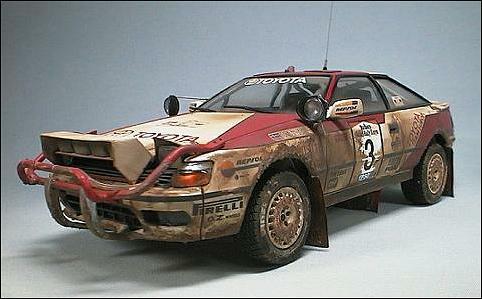 After achieving its success in rallying, the ST165 GT4 was superseded in 1990 by the larger ST185 model. Depending on the market, the updated 3S-GTE's power output was increased to 153kW (in Australian guise) while the driveline retained much of the same layout. A limited edition Carlos Sainz model (with even more power and a few other extras) was then introduced in 1992 before the final incarnation of the GT4 - the awesome ST205 - hit the road. This beast wowed the opposition with a serious aero kit and an engine capable of 178kW (again, in Australian spec) - but with a new retail price of over 80 grand it was obvious the GT4 was losing its original appeal. 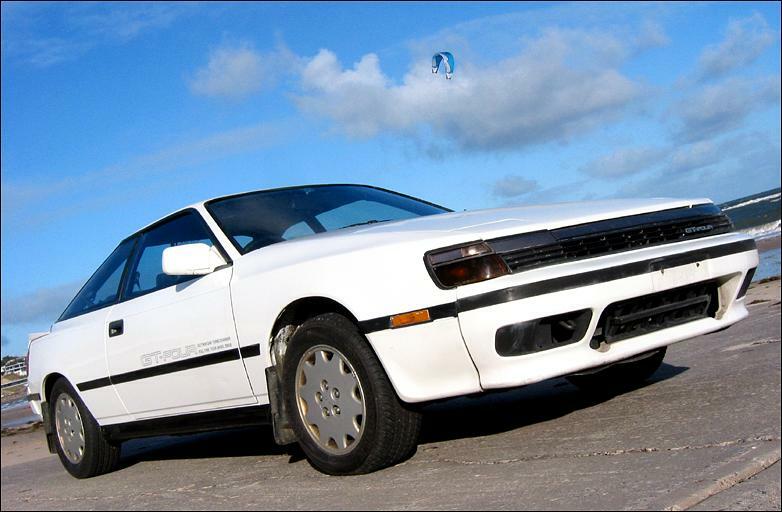 Once the ST205 Celica range came to an end, the all-paw GT4 died and - to this date - the void remains unfilled by Toyota. Thanks to Australian import rules regarding Japanese cars that are 15 years and older, the ST165 GT4 - a genuine piece of modern automotive history - can be picked up for a comparatively small outlay. The vehicle on test, for example, had 180,000 kilometres on it and was selling for around $9000. Compare that to what many people are asking for Holden VL Commodore turbos (from the same era) and the imported GT4 shapes up as a bargain; it feels w-a-y more advanced and much better built. As with any vehicle its age, though, there will be some areas that need fixing. The driver's seat on our test car was thoroughly worn, the passenger side power window didn't work and the suspension felt like it needed an overhaul. There were also a few annoying rattles from the hatch. Engine wise, though, it felt fine but we can't help wonder how much life is left in the turbo, engine, clutch and driveline. We have also heard that the electric pump for the water-to-air intercooler can fail. Unlike many grey Japanese imports, though, the ST165 GT4 has a pretty good parts back-up - the main body panels are the same as the locally-delivered atmo front-drive ST165 Celica while the driveline is very similar to that found in the locally-delivered ST185 GT4. We suggest only a few parts would be a challenge to replace. If you're after a little more power than the standard output, a high-flow exhaust and air intake will give about 15 percent more power, while boost can be upped to around 12 psi without problem; some sources suggest this can be achieved by drilling out one of the ports on the factory boost control solenoid to 4.5mm. Apparently, the larger turbocharger from the 7M-GTE Toyota Supra can also be fitted to the GT4 with only a couple of alterations. No question - with a few mechanical tweaks, the ST165 GT4 could be a real blast to drive. Add to that its collectable nature and you sure get a lot in return for your AUD$9000-odd.